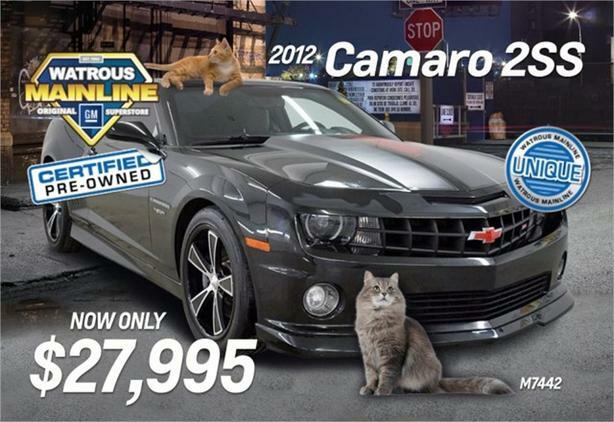 Passionate enthusiasts wanted for this sleek and agile 2012 Chevrolet Camaro 2SS. Savor quick shifting from the manual transmission paired with this high output HO (426HP) Gas V8 6.2L/376 engine. With an incredible amount of torque, this vehicle deserves a passionate owner! It comes equipped with these options: Brake/transmission shift interlock, ENGINE, 6.2L, V8, SFI, HIGH OUTPUT, Wireless PDIM, Wiper system, intermittent, Windows, power, front and rear, with driver and passenger express up/down, Wheels, 20 x 8 front and 20 x 9 rear painted aluminum, flangeless with sterling silver finish *w/WRS Rally Sport Pkg, sterling silver finish replaced w/midnight silver finish*, USB port, Universal Home Remote, Trunk release, power, and Trunk entrapment release, internal manual. Cruise for miles in this fabulous and whimsical Chevrolet Camaro. A short visit to Watrous Mainline Motor Products Ltd located at 208 1st Avenue East Box 70, Watrous, SK S0K 4T0 can get you a hassle free deal on this trustworthy Chevrolet Camaro today!